Maharashtra Chief Minister Devendra Fadnavis and Bollywood icon Amitabh Bachchan on Saturday picked up brooms to clean up the sprawling Sir J.J. Hospital complex as part of the NDTV-Dettol ‘MahaCleanathon’ campaign. “We have not come here to make speeches. We want to set an example and hope this movement continues and we can keep our cities clean,” Fadnavis said as he dug his hands into dirt at the event. He pointed out that all the hill stations in the state once had ‘kachra points’ which are now known as ‘Swachch Points’ to drive home the mission philosophy. “If each one cleans up 10 yards around their homes, the entire city will sparkle. 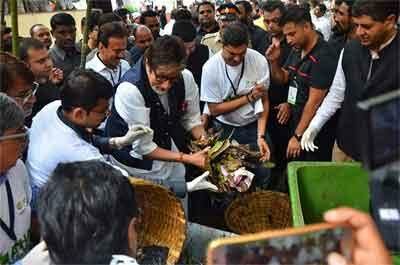 When you see somebody littering, tell them if you keep doing this, it will have an impact,” Bachchan said on the occasion. The campaign, launched in January 2016, aims to complete 50 lakh manhours to the Swachch Bharat Abhiyan and has already clocked in over 33 lakh manhours, with the rest scheduled to be completed by the year-end, said Principal Secretary, Urban Development Manisha Mhaiskar in the Maharashtra Government. Fadnavis said that by October 2 this year – marking Mahatma Gandhi’s 147th birth anniversary – 50 cities in Maharashtra shall be ‘swachch’ or clean, and around 7,000 villages have already become open-defecation-free. Several other celebs like Priyanka Chopra, Dia Mirza, Sonakshi Sinha, Arjun Kapoor, several ministers, government officials and commoners joined the initiative today, with many applauding when Bachchan and Fadnavis picked up the cleaning brooms.